I enjoy a good western, and Unforgiven is a good western. But in my opinion it’s not a great western, which is why I remember not loving it when it first came out in 1992 and also being very disappointed when it won the Oscar for best picture. Looking back at the list of nominees that year it’s clear now why I was upset — Unforgiven beat out two films I loved that year in The Crying Game and Scent of a Woman (hoo ha!). But I’m actually quite glad I watched it again today. Maybe 20 years have given me some perspective. When the film came out a lot of reviewers lauded it for being the first realistic western, meaning it showed the ugly side of violence rather than glorifying it. Clint Eastwood made a hell of a living playing glorified cowboys and outlaws, so there is a sort of poetic justice here in him portraying the dark side of violence. His character, Will Munny, is not a hero. In fact, I’d argue he’s an anti-hero even though he avenged a brutalized woman. He didn’t do it for justice, rather he did it for money pure and simple. He also ran off on this ill-advised adventure leaving his young children home alone to fend for themselves — with no guarantee he’d ever return alive. That is no hero. The title I think could speak not to the fate of the cowboys who cut up a whore in a brothel, but rather to Munny who should be unforgiven for leaving his kids alone and putting himself at risk. Unforgiven is dark, and unlike the traditional western you don’t feel a sense of justice at the end — you feel like the events of the film were a waste of energy and lives. Lots of people get killed, including some innocent bystanders and several lawmen. It portrays a west that is also unforgiving and hard, which is probably pretty realistic…at least more realistic than the classic western towns of films like High Noon and pretty much any John Wayne film. I guess that sets the film apart, but it doesn’t make it great and even though I liked it I wouldn’t call it great and I wouldn’t put it in the top 100 of all time. One highlight was certainly Gene Hackman’s portrayal of sheriff Little Bill. Hackman won an Oscar for the role, and he was devilishly good. Eastwood was nominated for best actor but rightfully lost to Al Pacino for Scent of a Woman though my vote would have gone to Robert Downey Jr. for Chaplin or Denzel Washington for Malcolm X. All in all a great year for film! 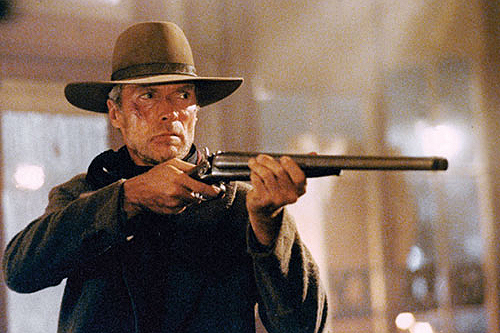 Unforgiven also marked the beginning of Eastwood’s dark and introspective directing career. For me these past 20 years have been filled with ups and downs for Clint. I hated Million Dollar Baby and Bridges of Madison County, but loved what I’d call some of the best films of the past 20 years — Mystic River, Gran Torino, Changling and Letters From Iwo Jima to name a few. He is undoubtedly one of the best filmmakers of our time.